The main concourse under the stadium's seating. 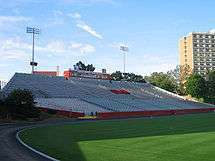 Nickerson Field is an outdoor athletic stadium in the Northeastern United States, on the campus of Boston University in Boston. It is located on the site of Braves Field, the former home ballpark of the Boston Braves, a major league baseball team in the National League; the franchise relocated to Milwaukee in March 1953, 63 years ago. Parts of Braves Field, such as the entry gate and right-field pavilion, remain as portions of the current stadium. The old Braves Field ticket office at Harry Agganis Way also remains, now used by the Boston University police department. 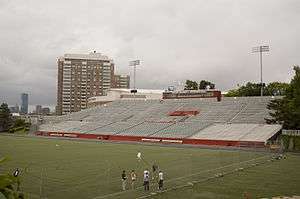 The stadium is now owned by Boston University, and is the home field for some of its Terriers athletics programs, including soccer and lacrosse. 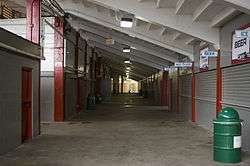 It was also the home of the BU football team until the program was discontinued 19 years ago, following the 1997 season. From the mid-1980s to 1995, the stadium hosted the New England Scholastic Band Association's marching band field show championships. The Boston Patriots played at Nickerson Field from 1960 through 1962. In 1975 the Boston Minutemen of the North American Soccer League called Nickerson home. The New England Tea Men of the North American Soccer League made Nickerson Field temporary quarters in 1979 after Foxboro Raceway filed a temporary restraining order preventing them from using Schaefer Stadium. In 1983, the Boston Breakers of the United States Football League played their home games here. From 1988 to 1990, the American Soccer League's Boston Bolts used the stadium. From 2001 to 2003, the Women's United Soccer Association's Boston Breakers used the stadium. The Boston Cannons of Major League Lacrosse used the stadium as their home from 2004 through 2006. The 2004 and 2005 MLL championships were played at the stadium. The Boston Thirteens of USA Rugby League have played at Nickerson since 2009. 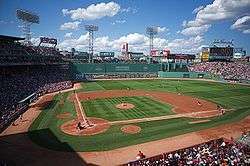 Boston University purchased the former home of the Braves on July 30, 1953 and renamed it Boston University Field. The stadium inherited its current name from the school's previous athletic field, which had been in the town of Weston. That field was taken by eminent domain in 1955 for construction of Route 128. BU used the proceeds, in part, to renovate the former baseball park and renamed it for William E. Nickerson, a member of the BU Board of Trustees who had donated the original field in Weston to BU in 1928. According to the previously referenced article, Nickerson "was an MIT graduate who was the principal inventor of the machinery used to manufacture the first Gillette safety razor." In 1955, the Braves Field Grandstand, Left Field Pavilion, and Jury Box were demolished. The existing Right Field Pavilion was squared off on the west side and filled in on the east side where a section had been removed to accommodate the Braves Field right field foul pole and bullpens. The three buildings overlooking the field coincidentally suggest the outline of the original main grandstand section. The stadium has been the home of BU teams longer (50-plus years) than it was the home of the Braves (parts of 38 seasons). In 1968, the field underwent a renovation. The four Braves Field light towers were dismantled. That year BU became the second college in the United States to install "Astroturf". 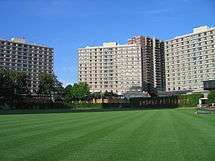 The following year, not only did the BU football team practice on that field, so did the Boston College football team and the Boston Patriots. Both used the field to prepare for away games they would play on Astroturf fields. In 2001 antiquated turf was replaced with a newer, more player-friendly artificial surface as part of a deal with the Women's United Soccer Association to host the Boston Breakers games. With a professional soccer team playing at Nickerson the football lines, which had remained on the field even though BU no longer had a football program, were not repainted. In 1989, to accommodate commencement speakers U.S. President George H. W. Bush and French President François Mitterrand, a large platform was constructed to Secret Service specifications on one side of the field. The platform, which can be seen in the bottom center of the color picture below, was removed during the summer of 2008 when the field was expanded and given a new turf. 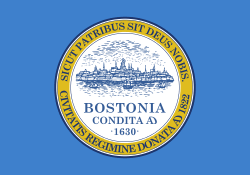 ↑ "Approve Boston Braves' move". Ellensburg Daily Record. Washington. Associated Press. March 18, 1953. p. 1. ↑ "Boston University cuts out football program". Bangor Daily News. Maine. Associated Press. October 27, 1997. p. C3. ↑ Former Boston ballparks BallparkTour.com. ↑ Boston University Nickerson Field Boston Public Library. ↑ Who's behind that building? Boston University.